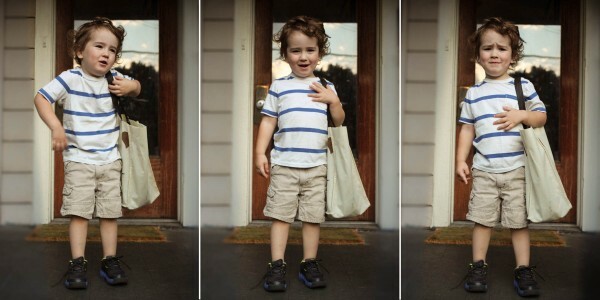 Not until last night was I really nervous about the huge change of sending Jack to preschool. He’s so excited and has been asking all summer when school starts. I’ve been excited too, because I would have the mornings to work. As of now, I do most of the stuff for this blog, as well as any other project I’ve got on my plate, once he’s in bed. So having Jack in preschool is a win-win for everyone. 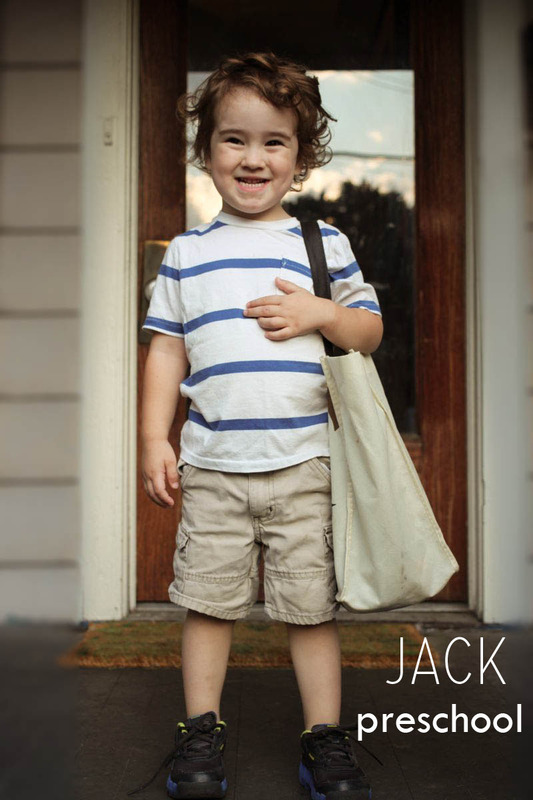 Yesterday he was practicing, “Hi, my name is Jack. What’s your name?” over and over again. My heart nearly exploded it was so adorable. This morning we made a list of everything he was excited about: talking about Toy Story with his friends, playing with new toys, seeing Oscar (one of his best little buddies who is going to the same school), running fast, using a tiny kid toilet, space, eating food, and singing tiny songs. He was so excited to get into the car it was hard to get him to sit still and smile normal for a photo – he only let me take four, so I decided to share them all. I scrapped the post I was planning today – I didn’t like the way the project turned out and didn’t care to put the effort into fixing it. All I wanted to do was to upload these hilarious photos of Jack and talk about how surprisingly emotional I was about walking out the door of his preschool this morning. I didn’t expect to feel so distraught over sending him to school. I woke up with that nervous first day of school knot in my stomach, which magnified the closer we got to school. I waited until Dan and I were back in the car to start crying, so that was good. I felt like a failure as I was telling Dan how I should have reminded to tell his teachers when he has to use the bathroom, I should have been the one to introduce him to some friends before we left. Maybe we shouldn’t of left so quickly? Do the teachers think we’re the worst since we didn’t stay long? I briefly entertained the thought having Dan turn around, and heading back inside to make sure he was alright, but that seemed like a crazy parent move. Deep down I know he’s alright, and even if he is sad or missing me he’s surrounded by such a loving staff of ladies who know exactly what to do with a little guy missing his mama. Oh my god. I am a blubbering mess. I really am so happy and excited for him. Preschool is going to be so much fun. P.S. The winner of the cookbook is announced over here! There will be another chance to win tomorrow!!! As a former pre-school teacher, you aren’t horrible for not staying longer. Sometimes its harder for kids to get settled and for the routine of pre-school to get started if parents hang around and watch. Imagine going to your first day of work and having your parents standing and watching. It is totally normal for you to be a blubbery mess. High props for waiting until you got in the car and for not going back to check on him. I actually had a mother who once waited outside the classroom crying and her husband had to bodily remove her. So, give yourself a pat on the back, your little dude is having his first day of school, with many more firsts to come…Cheers!! I love the glow in the pictures. I didn’t see it coming either, but had sudden blubbery moments with sending a child to school for the first time. With the first child I was overcome by the sight of the school building. With the second child I was driving alone the day before the beginning. Best wishes to both of you on this new adventure! I only know about this from a teacher’s perspective but it sounds like you did exactly the right thing! The fact that Jack is so geeked about school is evidence of that. I know I appreciate it when parents say goodbye and go, it makes it so much easier for the kids to start the day and empowers them to explore and take ownership of their new environment. I think it also demonstrates to Jack that you believe that school is important and a safe place with trustworthy people in charge. Bravo to you for being so brave and congratulations to your big-little dude! oh, emily! my heart is so excited and blubbery for you too right now! you are SO lucky that he was excited, and not crying and begging you not to leeeave himmmmm nooooo, that would’ve been brutal. not that i have experience in that arena or anything. next time i see you, remind me to ask where you guys decided to send him, i’m terribly curious. guess i need to start thinking about the “big p” for shoshi, too, before long…wahhhh! beaming wiggly love rays from my heart to yours. Are you ready for this?…it doesn’t get any easier seeing your first GRAND child head off to Kindergarten! We spoke on the phone after her first day, and I wanted to hear it ALL!!! I love being a grandma! Those little people tug at your heartstrings more than I thought possible! Jack is a cutie! Thanks for sharing! This is the cutest post. I love that he was practicing introducing himself! So sweet. And the photos are adorable! He’s so animated and happy. Jack is DARLING. I love this little glimpse into your life. And I’m sure it’ll get easier. Just wait till he comes home full of stories!